Disney is an entertainment powerhouse. ESPN, ABC, theme parks, movie studios, record companies, hotels, restaurants… you name it, Disney probably owns it. However, there’s one place where Disney’s omnipresent corporate claws haven’t fully sunk in, and that is in the young male demographic. Between preschool and the sports fan years, there is very little in the Disney trunk that appeals to young men. That’s why Disney went out and bought Marvel Entertainment. 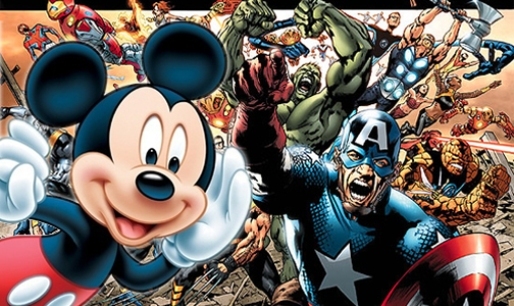 The proposed merger is going to cost Disney $4 billion plus stock, but it’s really a stroke of genius on the part of Robert Iger and the House of Mouse. If you can’t capture an audience, find someone who can. There’s nobody performing like Marvel right now. Not only are they the top comic book company at the moment, their movie properties are second to none. Iron Man, Thor, Captain America, the X-Men, Hulk, Ghost Rider, The Fantastic Four, Spider-Man, Daredevil, Elektra, The Punisher, Blade, The Avengers, Nick Fury, Sub-Mariner, Runaways, Deadpool and Doctor Strange all have had, or will have, movies coming out. That’s not even counting Marvel’s long history of successful TV animation properties and animated movies! Is it a little scary for a comic book fan like myself? Yeah, kind of. Marvel’s running on all cylinders right now, and just thinking about Disney coming in and mucking things up has my dander up; however, Disney hasn’t changed corporate culture at Pixar (as far as I know), so hopefully I’m worrying about nothing.